Cash is the lifeblood of GTA Online, as it gets you weapons, cars, houses, and everything else you need while cruising around Los Santos. You can earn money by selling cars, completing jobs and heists, and plenty of other ways. 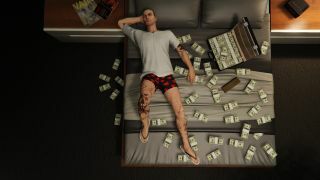 Collecting cash gets a bit easier as you level up, since more lucrative opportunities become available after spending time in the game - be sure to take advantage of Rockstar’s Newswire to see what missions are currently giving out double the cash rewards. Be sure to deposit any cash you earn into the bank straight away, since other players might be looking for an easy pay-day by killing you. You can do the same and seek out players that just completed a mission, but be ready to become a target if you keep causing problems for other players. If you’re looking for an honest living, then check out these suggested missions that pay a pretty penny - some of which can be played over and over again - and you'll be racking up the virtual dollars in no time. You, and a team of up to six, are ordered to destroy four garbage trucks owned by a rival gang. Each is guarded by several heavily armed NPCs, and once destroyed you’ll have to hunt down the other members of the gang and their crew boss. Trash Talk, after unlocking at rank 81, is one of the best paying and most efficient money-earning missions in GTA Online. It can net you $15,000 or more in four minutes - if you have a talented enough team. It’s always fun to spend a day at the pier. Pier Pressure, which unlocks at rank 6, requires you to crash a meeting under the pier in Del Perro, take out all involved, and return a package of meth to the person who assigned the mission to you. It’s an easy mission to tackle for any of number of players (up to 4), and can earn you a quick $15,000. If anything, it’s a nice change of pace from the concrete city. If you’re looking for a solo challenge then Rooftop Rumble, which unlocks at rank 75, might be more your speed. It's a difficult mission that can net you over $20,000 if you take your time completing it - simply running up the clock usually nets you more cash for missions. All you have to do is blow up a meeting between the FIB and the Professionals, steal the documents they were exchanging, and deliver them to the the person that assigned you the mission. Unlocking at rank 12, Blow Up is another early mission that can get you tens of thousands of dollars by completing it on your own. All you have to do is destroy a bunch of vehicles at a dealership, lose the cops, and then return to the dealership. A smart way to go about the carnage is to move all the vehicles closer together before using explosives, as this will make it easier to blow them up and lessen the likelihood of the cops showing up. Looking for more ways to top up your virtual GTA dollars? Then check out our GTA Online Shark Card guide to find out which card gives the best value, and what you can buy with it.